Welcome to the inside of Moppa Elliott's brain. Or maybe more accurately, Elliott's brain, and his childhood record collection. 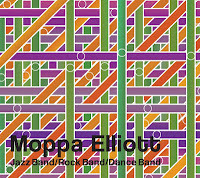 Jazz Band/Rock Band/Dance Band is a rare concept triple album, formed around three different groups with different internal relationships, and plumbing the depths of 60 years worth of music; an exercise in multi-genre attacks showcasing Elliott's versatility in composition, in playing, and in friends. Advancing on a Wild Pitch are our Jazz Band, a cohesive unit covering a very composed late 50s/early 60s moment. It's a classic sounding quintet with a strong rhythm core and two accomplished horn players. There are playful old-time ambles along like Oreland, simply structured for everyone to take a solo turn, co-ordinated melodies and traditional sounds. There's a controlled jaunt, a ballad, and a walking bass breaking into a jog, but ...Wild Pitch really settle into a groove on the sulky, more muscular Baden, with Charles Evans's rolling baritone sax, and Sam Kulik's swooping, building trombone. But they are at their most comfortable playing on Herminie, a genuine, warm tune, turning through horn chord interplay, a cheerful call and response, and a familiar-sounding earworm, bounding-along vibe. From these serene climes, Unspeakable Garbage is a bit of a surprise. Rocks, MD, is all blaring tenor sax slipping all over the place, a chaotic high-energy horn line over a mainstream rock backing, a brief George Michael instrumental reference incongruously dropped in. We're then treated to a very major, vanilla opening. As we slip into our Rock Band, it feels like Elliott's time as a teacher of music theory and history is coming through. A challenge to accept a theme, then study, imitate, and compose closely to it. It partly depends what Elliott has chosen to define as a genre. Jazz, Rock, Dance – these are the broadest of terms. 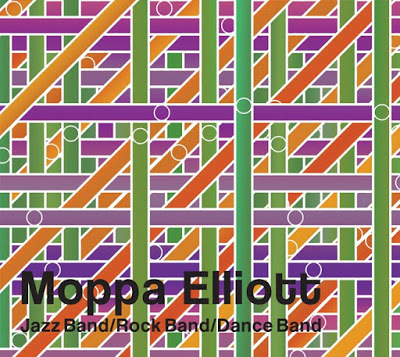 There was some breadth in Jazz Band but it was still focused on a small slice of time, but for Rock Band, in particular, Elliott has embarked on some heavy experimentation into different decades and sub-genres. All the musicians in Unspeakable Garbage are clearly peak talents and leaders, but like polar explorations - where some trips were groundbreaking pinnacles of endeavour and others ended in tragic death – their collective explorations have varying levels of success. They journey through Zappa, Van Morrison, Van Halen, Dexy's Midnight Runners, and U2. Throughout most of it I assume they were sporting leather trousers, in spirit if not in practice. Elliott as much as acknowledges this in his writings and embracing the cheesy moments, when all that comes out is corny TV sitcom themes. The Dance Band Acceleration Due To Gravity are the most interesting prospect of the trio. I naively expected Detroit house or EDM, but while Elliott touts this as modern groove music built on loops and refrains, to my ear there is not much hip hop or R& B either. Instead, this is a deeply engaging set of tight, pop-song length pieces that stack genres into short pulsing avant jazz prog rock moments. Waddle is a free-range pianist being chased by a plundering horn line and a silly rhythm section; it's equal parts Balkan beats, and Gong psychedelic space rock. There are funkier big band dance tunes, and contrapuntal horn arrays, and prog rock voyages. Kanye West's Power is turned into a pumping, orchestrated marching band, taking a strong brief head and spinning a very changeable piece. Sparks is the tune of the album, a punching discordant introduction to a stomping moody background with Elliott letting the bass drive, and some virtuoso leads from Nate Wooley on trumpet and Ava Mendoza on guitar. In the end, the sandwiched Rock Band album acts more as a musical reset, an intermediate spin of the dial to cleanse the palate between a classic Jazz set to ready the listener for the Dance Band. Unfortunately, as a transitional moment, the execution is frustrating: strung over the end of the first CD and the start of the second, it's more an odd collection sprayed between the other two albums. For me a triple album concept relies on pauses and resolution between phases – it really needs to sit on three individual CDs instead of squeeze onto two. However, any minor gripes on presentation and graphics are overcome by the eye-opening array of Pennsylvania place names, carefully subdivided to match each musical style. While I struggled with the three albums jumbled together on record, I think they may very well be a different proposition live. Acceleration Due to Gravity, in particular, has the potential to throw off the shackles of damp production to come alive as raw excitement when played by a nine-piece on stage. There's only one way to find out – at the album launch at Shapeshifter Lab, Gowanus, Brooklyn on February 15. Moppa Elliott (bass); Sam Kulik (trombone), Charles Evans (baritone sax), Danny Fox (piano), Christian Coleman (drums). Moppa Elliott (bass); Jon Irabagon (tenor sax), Nick Millevoi (guitar), Ron Stabinsky (piano), Dan Monaghan (drums). Elliott (bass); George Burton (piano); Mike Pride (drums), Nate Wooley (trumpet); Dave Taylor (trombone); Matt Nelson (alto/soprano sax); Bryan Murray (tenor/soprano sax), Dr. Kyle Saulnier (baritone sax), Ava Mendoza (guitar).